Despite the passing of human rights and other anti-discriminatory legislation, Travellers, Roma, Gypsies - their names are many and various - face persecution throughout the European Union. Discrimination over access to education, housing and health services is much the same whether they are Irish Travellers living in trailers in South London, or settled Roma living in sub-standard accommodation in South-Eastern Poland. 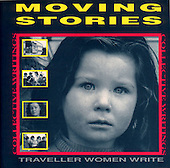 The photographs in the book 'MOVING STORIES: Traveller Women Write' were taken over a period of a year, in collaboration with Southwark Traveller Women's Group. They complement a collection of autobiographical writings which the women produced with the help of Elizabeth Laing, of the Traveller Education Team. The book won the 1992 Raymond Williams prize for Community Publishing. The group first began meeting to try to improve their living conditions and to fight the discrimination which their families face on a daily basis. In addition to the campaigning and organising which grew out of these meetings, the women conceived the idea of writing a book through which they could convey something of the life of their community. At quite an early stage the women decided that photographs should be a significant element of the book. Thus the women's writings appear side by side with an extended photo essay. The Roma population in POLAND is estimated to be 50,000. Although small compared to the 800,000 in Bulgaria and 2 million in Romania, where they comprise roughly 10% of the population, widespread prejudice still exists. As regards educational opportunities, Roma children are at a particular disadvantage, and most do not even complete primary school.